I really like Twitter because it allows me to share short messages, we have a great community, and 140 characters are enough for everybody. And this statement was exactly 140 characters, but sometimes I want to say more than that. And that's why I finally created this new blog. I was never really into blogging because I barely had time or the audience to write long articles. I sometimes wrote short stories for sites like undeadly.org, I collected some of them here, but my own blog was hosted on tumblr and never saw any activity. I want to try it again, and this time I decided to create a self-hosted blog. Something that runs on my own server and with httpd, the web server that I wrote for OpenBSD. So I was looking for potential blogging tools that I could use to run my own blog. Besides the popular and heavyweight ones such as WordPress, there are countless other options: I looked at blogs from fellow developers, such as Ted Unangst's flak (I like the fact that it is written in Lua but the implementation is a bit over my head), or Pelican that is used by Peter Hessler for bad.network (but, sorry, I don't like Python), and finally Kristaps Dzonsons' sblg that is used for all of his projects and blogs. I decided to use sblg. 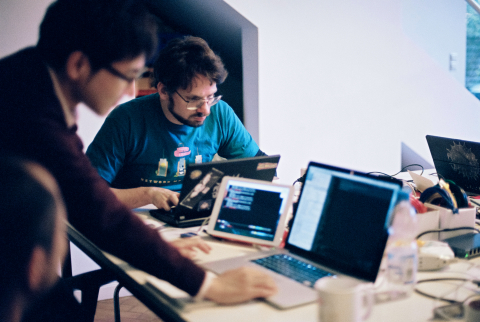 When I heard that Martin Pieuchot (mpi@) was looking for a place to hold another mini-hackathon for three to four people to work on multiprocessor (MP) enhancements of the network stack, I offered to come to our work place in Hannover, Northern Germany. We have space, gear, fast Internet and it is easy to reach for the involved people. Little did I know that it would quickly turn into n2k15, a network hackathon with 20 attendees from all over the world. This story was originally posted on undeadly.org. I have organized a hackathon before when we had the k2k6 in Kransberg, the castle of a German Internet pioneer. But this was a long time ago and I didn't have to run it in my own place. Im talking about the K14 the spare office space of Esdenera Networks that were renting out for coworkers to get a little activity and creativity into our daily work lives. After my previous job I told myself that I never wanted to work in a boring business-like office anymore the type with long floors, glimmering neon lights, bad coffee or even shabby cubicles. Im glad that Ive found a pretty decent place, but I never expected to host an actual OpenBSD hackathon in there. I came to Canada to speak about OpenIKED at BSDCan 2013 in Ottawa, moved on with an amazing road trip through Eastern U.S., and finally arrived at the t2k13 OpenBSD Hackathon in Toronto. I usually don't have a fixed agenda for hackathons, so I arrived there, talked with fellow developers and decided about my coding tasks. After I talked about OpenIKED at BSDCan, some people kind of expected that I would work on iked(8). But I didn't. I started with helping our new developer Masao Uebayashi (uebayasi@-san) to get the new vmx(4) driver into the tree and contributed a manual page based on my original vic(4) page. vmx is a driver for the latest VMXNET3 virtual Ethernet chipset that is found in recent versions of VMware. In difference to vic, that was written by dlg@ and me to support VMXNET2 and older, vmx and the VMXNET3 protocol emulate a modern PCI Express chipset with support for MSI (Message-Signaled Interrupts), proper checksum offloading, VMware's VLAN Guest Tagging (VGT) mode and many other features. And it's going to be faster. I recently sent an email to OpenBSD's misc@ list where I explained some details of the experimental support for SSL Interception ("SSL-MITM") in relayd, my versatile networking and load balancing software for OpenBSD. The content of the email is quite interesting, so I modified it a bit to post it as an article. As you probably know, relayd already supports running as a transparent non-caching HTTP proxy that can be used for URL filtering and policy enforcements. It also supports running as an SSL server and can be used to terminate SSL connections and to forward them as plain TCP. The marketing term for this is "SSL acceleration" and is typically used to provide HTTPS on the load balancer for HTTP-only webservers in the pool. Some time ago, I also added support for running relayd as an SSL client to terminate plain TCP connections and transparently tunnel them through SSL. I don't know if there is an actual marketing term for it, but let's call it some kind of SSL VPN ... whatever SSL VPN means. When I fixed support for a number of newer ath(4) variants, I asked for an EeePC donation to work on the currently unsupported wireless chipset that is integrated in most of these mini-laptops. Just about one week later I got two donations - an EeePC 701 and an EeePC 900. And I had more donation offers from other users, I really appreciate your support! © 2013–2017, Reyk Flöter. Built with sblg.